For enslaved people, the precursor to Thanksgiving was cornshucking time and other harvest events, usually held in October-November. Cornshuckings and harvest dances were key in breaking up the brutal monotony of enslaved people’s lives. The national holiday of Thanksgiving, which was popularized and encouraged by Sarah Josepha Hale, was finally instituted as a result of her 17 year campaign, by Abraham Lincoln, who instituted the holiday in 1863, the same year as the Emancipation Proclamation. Thanksgiving was supposed to bring the country together in the midst of the Civil War, giving Americans a common cultural rallying point. Later, according to Andrew F. Smith, Thanksgiving became a tool of Americanization for incoming immigrants. A religiously neutral, apolitical holiday built around the idea of gratitude for home and blessings, the Thanksgiving narrative was promoted in schools and found itself modified by each culture and community. Although we were not considered a part of the “huddled masses,” Thanksgiving no less brought African Americans together and gave them another reason to pray, be thankful, share with family and friends and eat. In the North, before the Civil War, Blacks celebrated their own Thanksgiving Day. It was usually held on January 1, 1808–the date Congress abolished the slave trade from Africa to America. It was a day of commemoration–sermons were given about the greatness of the African past and problem of slavery. Similarly, Edna Lewis, the Grande Dame of Southern cooking talked about how her family would celebrate Emancipation Day in the fall rather than Thanksgiving Day. The elders in the community who were enslaved would tell stories about their lives in slavery and the coming of freedom. —Macaroni and Cheese–Noodle and cheese dishes from Western Europe were adopted and adapted by the late 18th and early 19th centuries by the plantation elite including a certain Thomas Jefferson, who served it in 1802 at the White House. Macaroni dishes go back to Italy and France, and by the 1300’s England had its own noodle/cheese/butter dish. According to Wikipedia, macaroni with cheese was an upper class dish into the 18th century. 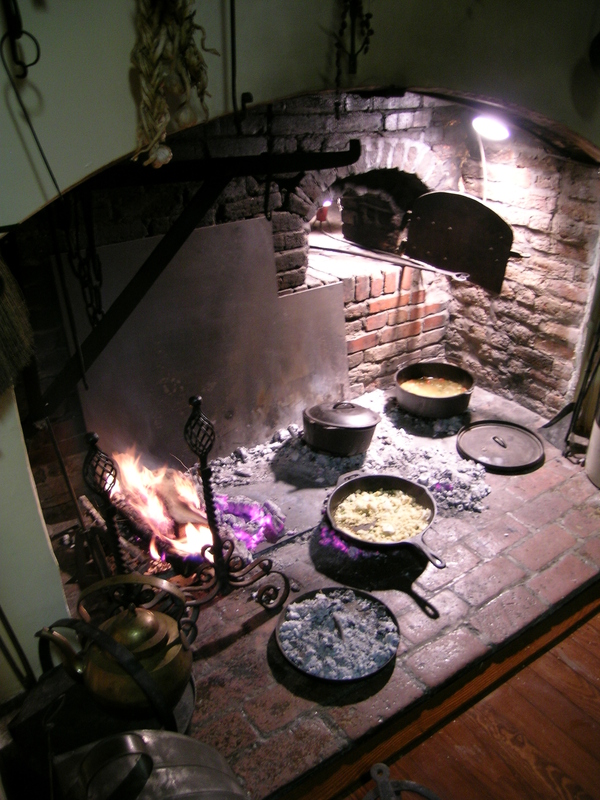 Macaroni pie–the traditional Southern name for macaroni cheese was served on plantation tables in South Carolina throughout the antebellum period. 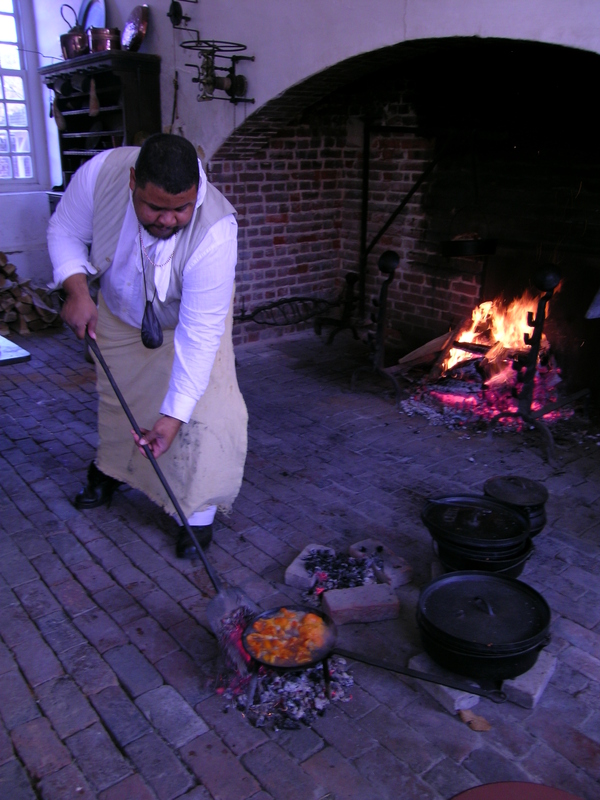 It was one of many foods from the “Big House,” that became part of the African American cannon just before the end of and after slavery. 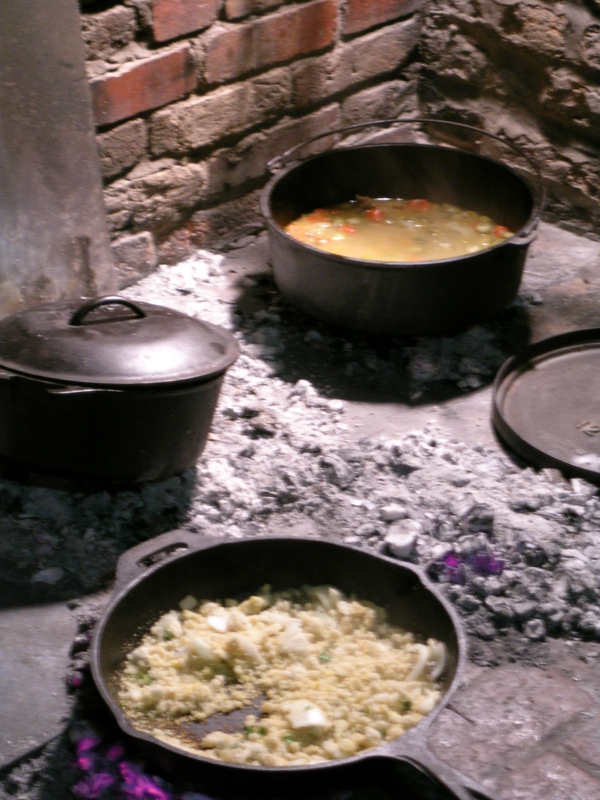 At least one enslaved person’s narrative talks about a dish similar to macaroni and cheese being prepared by the enslaved during special times before the Civil War. And no Patti Labelle, we weren’t the first or the last to put paprika on top–or on our potato salad. (I love you, Patti 🙂 ). There is something that we do to macaroni and cheese though–whether its garlic powder, paprika, hot sauce or hot pepper, multiple cheeses, there is some kind of invisible soul that goes into really good Southern mac and cheese. —-Sweet Potatoes—“It is one of the most delicious foods of this country, and the sweet potatoes are far better than those of America. They make a pap out of them …” Jean Barbot, 18th century Ghana, formerly the Gold Coast. If Wolof and other Senegambian women were highly valued for their domestic abilities, especially cooking and childcare, is it possible that the West Atlantic term “nyam,” could be the root of our words “yum” and “yummy?” Much like the Jewish mother ofEastern Europewho said “Ess, ess, mein kind,” the Wolof mauma probably said “Nyam, nyam!” to her white charges. Overtime, at least in my mind, the term became “yum,” and “yummy” and was associated with delicious food. Anytime you look in the dictionary and it says “origin unknown” they’re talking about us…. 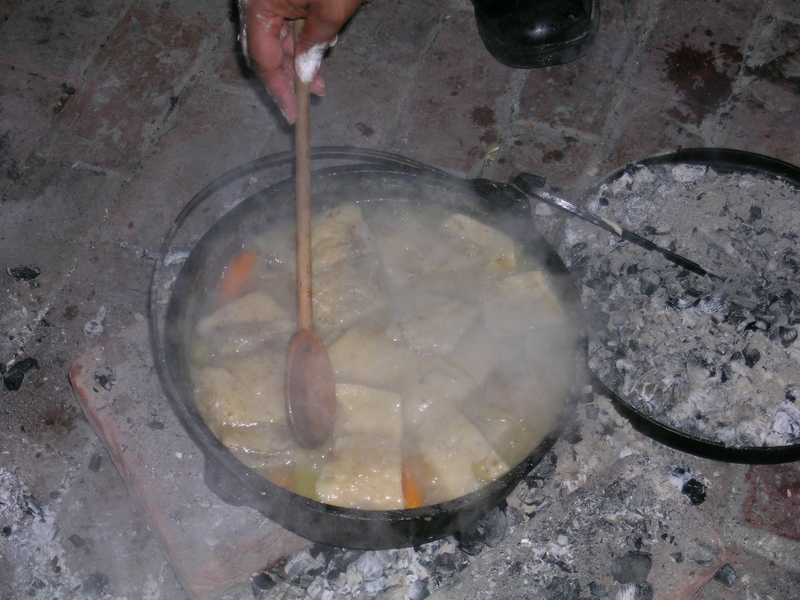 When enslaved Africans were introduced to European puddings they were reminded of the steamed vegetable and grain dishes they knew in their homelands. Europeans on the coast of Africa introduced the concept of “desserts” to tropicalAfrica. Sweet potato pie is Creole in the sense of its combination of a tuber with a spicy pudding with a pie form. After reading several recipes, it appeared to me that the sweet potato pie we eat today does not really approximate the taste of the kind of sweet potato pies eaten in the quarters. Eggs, butter, white sugar, vanilla, flour, spices, etc. would have all been very precious ingredients. Two recipes suggested rum in place of spices and vanilla extract, and we know that liquor was a commonly traded item in the quarters, particularly West Indian rum. If nutmeg or cinnamon was ever included in the pies in the quarters it was probably purchased at great expense, traded or liberated from the Big House pantry. Pre-heat the oven to 375 degrees. Mix all of the ingredients for the inside together and pour in to fill the crust. Bake for 45-50 minutes or until the knife or fork comes out clean. —Collard Greens—Collards are not African. They are a Eurasian plant in the cabbage family. Most likely they were brought with kale by the Portuguese to the gardens of slave forts along the coasts of Ghana and Kongo-Angola and were adopted and adapted to indigenous African cuisine. Collards fit into an African culinary model of having leafy greens that get stewed down. In traditional West and Central African cuisine there are dozens of varieties of wild and cultivated greens–including the leaves of sweet potatoes, okra, cassava, amaranth, and wild edible weeds. 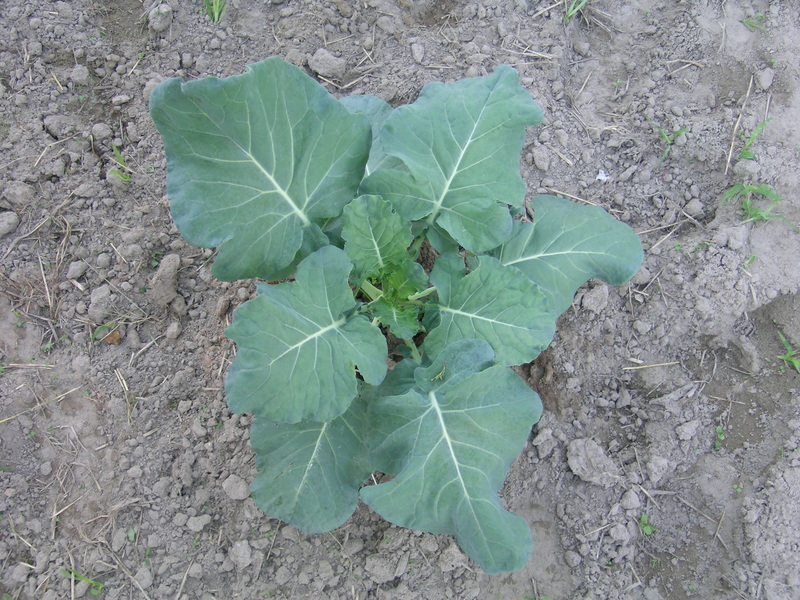 Collards are an old part of African American culture. No American ethnic group is more associated with the collard than we African American are, although collards are part of the food culture of Brazilian, Portuguese/Azorean, and Ethiopian communities as well. 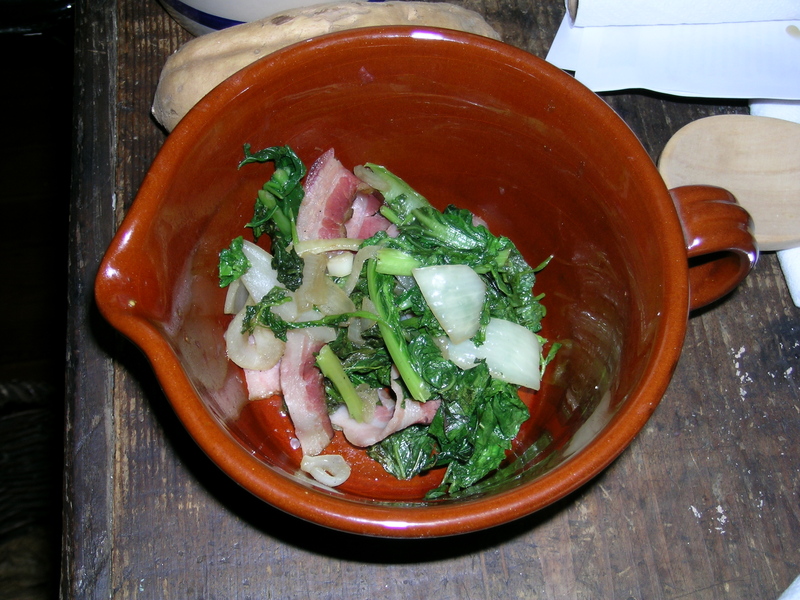 Collards were eaten in the enslaved community of Brazil just as they were in the southern United States. The earliest reference we have to collards in the African American community–that we know of, is from Captain William Feltman of Pennsylvania involved in the Southern campaign that resulted in the victory at Yorktown. Feltman was traveling through Hanover County, Virginia where he had watermelon and observed on August 17, 1781, “The negroes here raise great quantities of snaps and collerds. They have no cabbage here.” If you think the hot sauce next to or in the greens is brand new–forget it—as early as the 18th century in what it is now Ghana: “The rich often have the meat of pigs, goats, harts and cows, as well as of a large number of fowls, from which they (make stock) for cabbage soup, and several other stews they have learned from the whites and passed on from one to another. Malaguetta (native hot pepper seeds) is always prevalent in all their stews.” Jean Barbot, 1732. This recipe is a sauce made from collard greens that can be eaten over rice, similar to dishes from Sierra Leone and Ethiopia. Heat the olive oil in a large pan and saute the onions and garlic until translucent. Add the hot pepper and some of the stock and cook for a few minutes. Add the collards and bell pepper slices and the remaining stock. Season with salt to taste, mix, cover and cook for twenty minutes. Serve on its own or spoon over cooked rice. My father was a boy during the Great Depression and his family ran a boarding house in Durham, NC as a means of survival. One of the things my grandmother served was kush, and it was one of my father’s favorite foods. All I remember him telling me is that it was made from cornmeal and onions. If you have a recipe I would LOVE to have it! Sadly, my father passed away a couple of years ago, so I won’t be able to fix it for him—but I can eat some in his memory! Thanks for your fascinating work! The word kush comes from the Hausa language of Upper West Africa, through the Arabic term for couscous. Called kush in the Chesapeake and Carolinas, and coush-coush, in Louisiana, there were various versions according to the region one lived in. There were plain versions, sweet versions, savory versions. Kush was a good way to use up any stale or crusty leftovers—pot liquor–the stock left over from cooking greens or other vegetables, hot peppers and cooked onions were combined to make a mush with which to eat other foods. My friend John Martin Taylor, author of Hoppin John’s Lowcountry Cooking, said that when he was living in the Carribean they made several dishes similar to kush, like funji (foongee) which comes from an Mbundu word from Central Africa meaning, “mouthful.” Besides that, he learned about kush from his Appalachian grandmother. Across cultures–Native American, African, and European we share a world of food! Heat the lard, shortening or oil in a large skillet, Saute the onions until they are translucent, adding half of the salt and half of the red pepper flakes, and some of the herbs. As the onions begin to turn clear, add the meat if you choose, and add the rest of the oil to the pan. Slowly incorporate the crumbled cornbread into the skilled until all it is completely incorporated. Add the rest of the red pepper, herbs, and salt, and the stock to moisten. Cook over a low heat and stir frequently until the stock has been fully absorbed. Do not allow the kush to burn. Serve immediately with boiled vegetables or fish. I’m ready to celebrate another Thanks-giving armed with a deeper appreciation of its origins and layered meaning for various celebrants. This is so interesting, thanks! I’m planning a post on African American Thanksgiving foods and this gave me some ideas. Could I use your recipe for Kush on my blog with an attribution? I am going to share this blog on FB…thank you so much for all your good works! Wonderful teaching! I’m looking forward to discussing it over the Thanksgiving table! Thank you so much for uncovering this history and sharing it. Great information. I was looking for this exact info to share with my students and family. Very interesting. Love learning about our history. great recipes and history! And great scholarship on your part. Also makes my mouth water, and I want to get cooking! If I wanted to explore adding the rum taste, but keep the pie alcohol-free, should I use the McCormick’s-recommended ratio of 1 T rum extract for each 2 T of dark rum or 1/2 t rum extract for each 2 T of light rum? I don’t know from spiced rum– is it dark or light? A whole tablespoon of extract seems like a lot. Should I add some spice to make up for the loss of spice in the rum? Sorry to be picky but I’m really interested in trying this authentic recipe without using alcohol for my peeps in recovery!